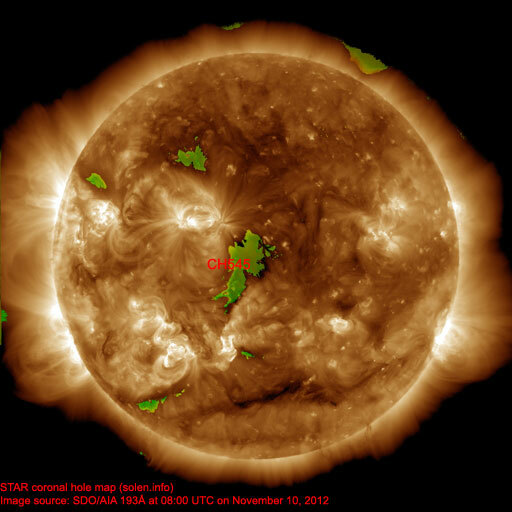 Last major update issued on November 14, 2012 at 05:30 UTC. 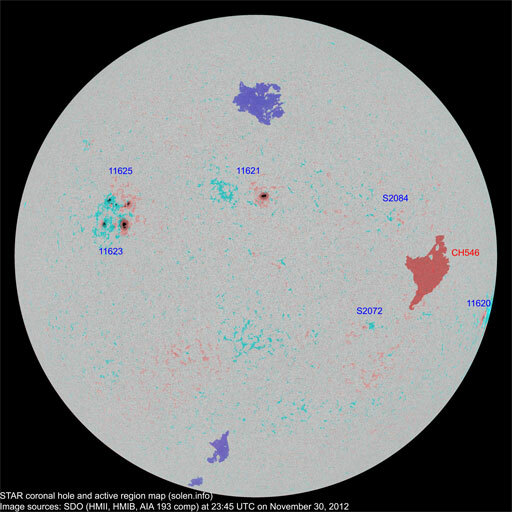 The geomagnetic field was quiet to minor storm on November 13. 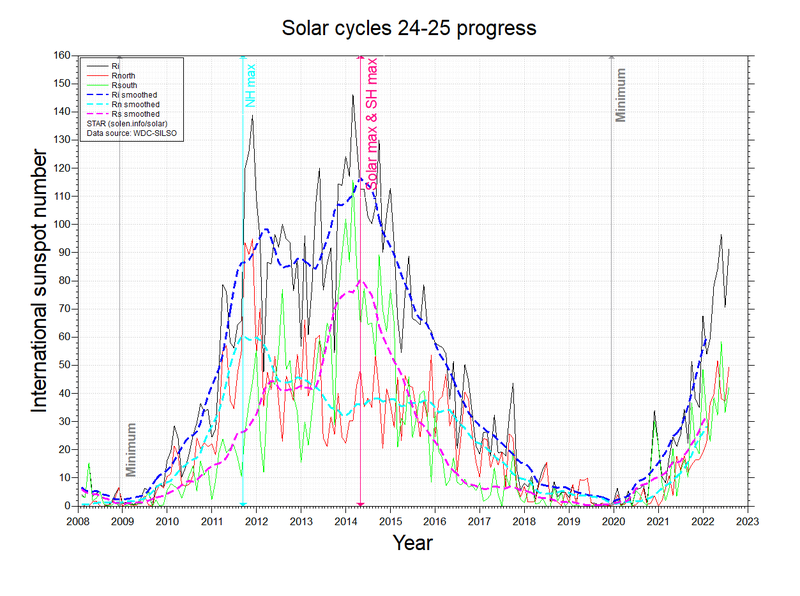 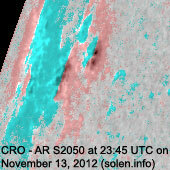 Solar wind speed at SOHO ranged between 346 and 570 km/s, mostly under the influence of CME effects. 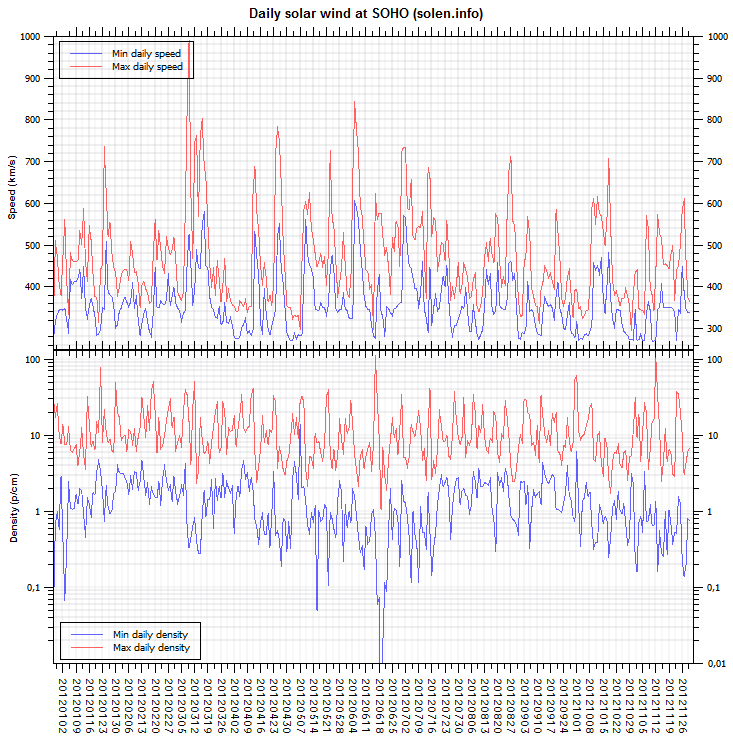 The interplanetary magnetic field was mostly northwards for the first half of the day, then swung gradually more southwards and was strongly southwards by the end of the day. This caused major geomagnetic storming early on November 14. 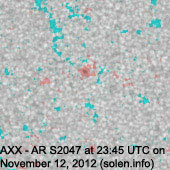 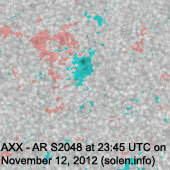 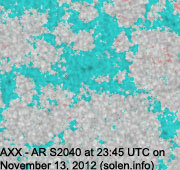 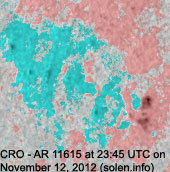 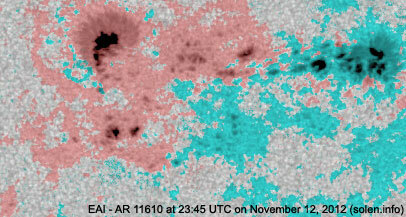 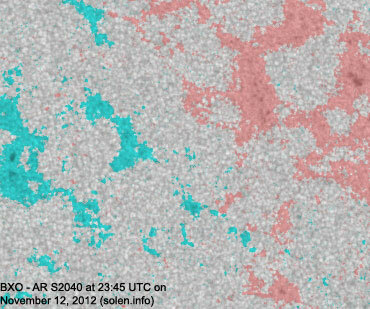 Solar flux measured at 20h UTC on 2.8 GHz was 146.2 (increasing 11.2 over the last solar rotation). 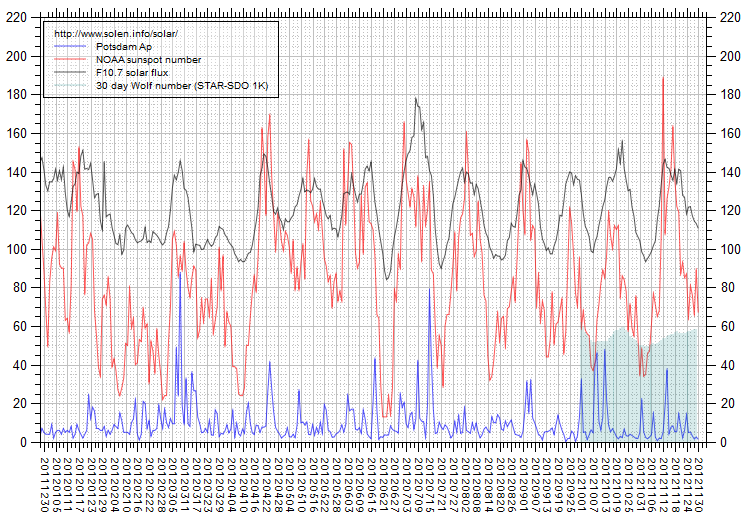 The Potsdam WDC planetary A index was 22 (STAR Ap - based on the mean of three hour interval ap indices: 21.9). 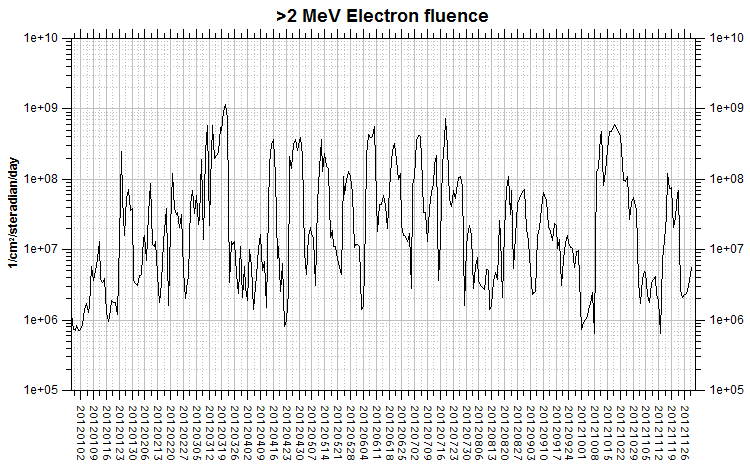 Three hour interval K indices: 54242334 (planetary), 33233422 (Boulder). 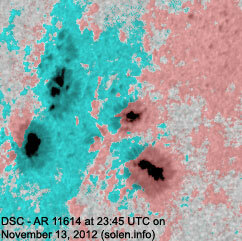 Region 11609 [S17W17] decayed slowly and quietly. 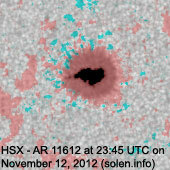 Region 11610 [S24W24] decayed slowly and was quiet. 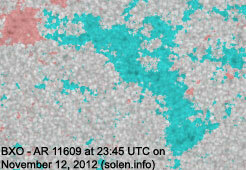 Region 11611 [N11E01] developed slowly in the trailing spot section with weak polarity intermixing observed. 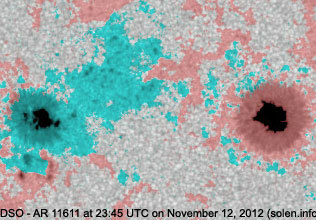 Region 11612 [N07E10] was quiet and stable. 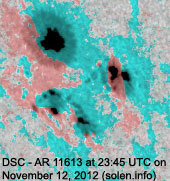 Region 11613 [S25E33] decayed and lost the largest magnetic delta structure after the last of the 3 M class events produced during the day. 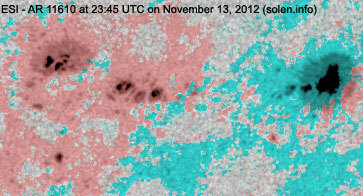 There's still a weak magnetic delta structure present in a southern penumbra. 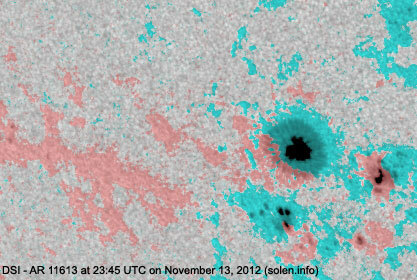 Flares: impulsive M6.0 at 02:04, impulsive M2.5 at 05:50, impulsive M2.8 at 20:54 UTC. 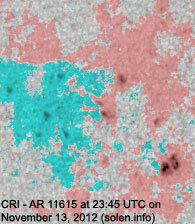 Region 11614 [N14E46] matured and simplified magnetically. 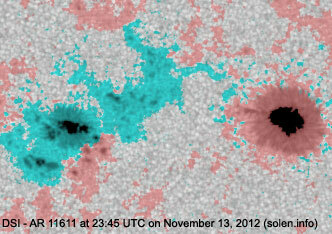 Region 11615 [N07E33] developed slowly and was quiet. 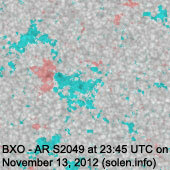 S2040 [N10W37] was quiet and stable. 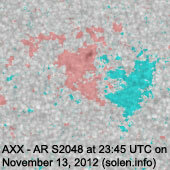 S2048 [N25W14] lost the leader spot and gained a trailer spot in this reversed polarities region. 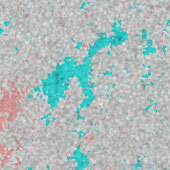 New region S2049 [S16E18] emerged with tiny spots. 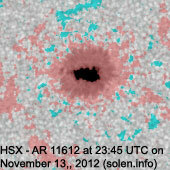 New region S2050 [N18E75] rotated into view. 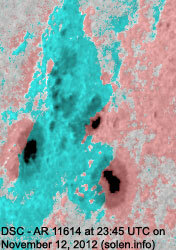 Although there are no impressive spots, opposite polarity spots are fairly close centrally. The geomagnetic field is expected to be quiet to major storm on November 14 due to CME effects and quiet to unsettled on November 15-16.